Bus from Kuala Lumpur to Jasin is one of the important direct transportation option among the residents living in Jasin. This bus service is mainly taken by local residents going back to their hometown Jasin during off day and holidays. Mayang Sari Express is the only bus company serving bus from Kuala Lumpur to Jasin. Mayang Sari Express is one of the popular bus operators in Malaysia which is based in Muar, Johor. The operator has reputation in providing safe journey and punctual departure. Therefore Mayang Sari Express have strong support from locals. Mayang Sari Express has up to 4 daily trips from Kuala Lumpur to Jasin. They operate this bus route with standard 40-seater coach. The first bus service is starts in the early morning 8:30am. The following schedules are 12:30pm, 4:30pm and 8:30pm. The duration from Kuala Lumpur to Jasin takes about 2.5 hours depending on the traffic condition. Washroom break will be provided upon request from the driver. Please note that all the buses in Malaysia have no bathroom on board. The bus fare from Kuala Lumpur to Jasin costs at RM 16.00 for adult and at RM 12.00 for child. All the passengers will board the bus from the main transportation hub in Kuala Lumpur, namely Terminal Bersepadu Selatan (TBS). Upon reaching Jasin, all the passengers will align from the bus at Jasin Sentral Bus Terminal. The departure time and seats for bus from Kuala Lumpur to Jasin is limited, passengers are advised to book bus ticket online to prevent disappointment. The booking process in BusOnlineTicket.com is user-friendly and payment is secured. 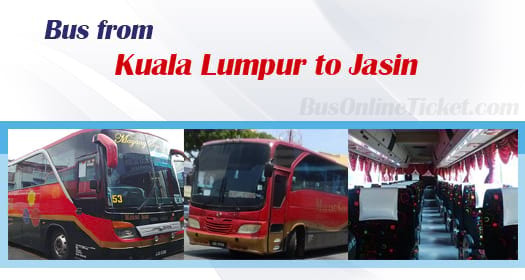 Book your bus ticket from Kuala Lumpur to Jasin now to have a peace of mind before travelling.